This warm and inviting wall art by Merce Flores captures the essence of a vase overflowing with bright yellow blossoms. This piece will add warmth and joy to any setting. 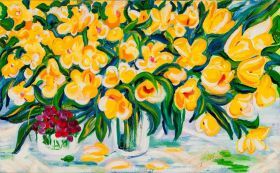 The paintings of Merce Flores has dynamic brush strokes, both, vigorous and determined, not aiming to model reality, but to explore the possibilities in expressive color, that predominates above the line, and with the color as impulse and goal, creates a world that is holds to itself by its authenticity.
) She is an “expressionist-fauve” painter. Her inspiration is coming from the nature, which is full of colors. Has been member of the Association Spanish of painters and sculptors and has been painting teacher at different schools in Barcelona since 1996. Since the beginning of her career she has maintained her studio in Barcelona. She has traveled to several European Year Capital cities of the Culture like Lisbon, Copenhagen, Stockholm, Weimar, Brussels, Helsinki, Prague, Reykjavik, Porto, Rotterdam, Salamanca, Santiago de Compostela, Luxembourg and Riga. In 2010 she has traveled frequently to Holland and in 2014 and 2016 she has stayed in Chicago for some weeks, continuing with her creative activity. 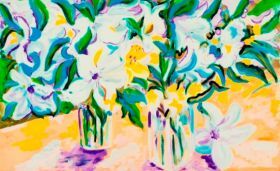 White Flowers by Merce Flores features a collection of lillies lit by dazzling sunlight. This warm summer setting will add a fresh window into a warm world, no matter the season in your home or office. 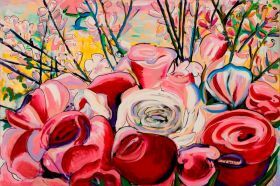 Roses by Merce Flores features a delicate bouquet of pink and red roses crowned by a background of cherry blossoms. This piece, reminiscent of a romantic Valentine's day, reflects the beauty and passion that can be found in a simple bouquet.